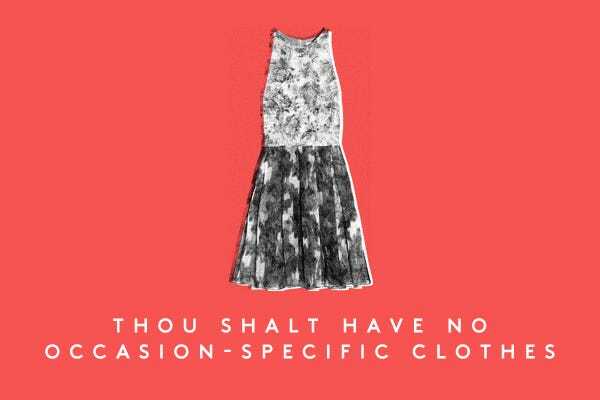 Because it's the Polar Vortex Part II, and maybe you don't know what to wear. I know we don't live up north, but Texas is home to its own brand of crazy weather. One day you're in shorts and a t-shirt, and the next you're wondering where you packed that Pendleton coat. Today calls for layers - lots of them. Let's stay in and paint our nails. Check out my "Nailed It" Pinterest board for fun ideas! Two of the mall's most potent stores face off on opposing corners - Origins & LUSH, competing for my loyalty and wallet-ensconced dollars. I'm definitely an Origins addict (Dr. Weil all the way! ), but this weekend, LUSH won. I popped in for a hair treatment that a coworker had recommended on her blog, and entered the store with the sole intention of purchasing just that item, and walking out. Which of course, at LUSH, never happens. A conversation with an associate (and my own cheapskate-ness) had me looking at other items almost right off the bat. Truth be told, I didn't really need yet-another hair treatment (like the Roots item I was looking at), but I was in dire need of a new shampoo/conditioner system. I couldn't decide on a shampoo to try, so the associate hooked me up with some generous samples. 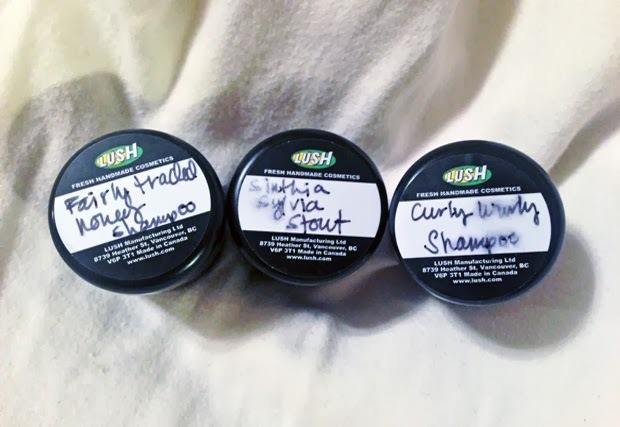 I was very excited to try the Cynthia Sylvia Stout shampoo, chock-full of organic, vegan stout beer from a local brewery, supposed to infuse "smoothness & gloss" into frizzy-prone hair. The LUSH site smells just like it's described - a brandy, stout and lemon cocktail. Last night, I lathered up and inhaled what smelled just like a summertime BBQ in Texas. Next on the list is the Fair Trade Honey shampoo, made with over half honey to give hair moisture and shine. I haven't tested this yet, but I'll use it as soon as I run out of the Stout sample. Despite my protestations that I'm not really a "curly-haired" girl (I'm more of a waves and beach texture gal), the associate loaded up a sample of the pot-housed Curly Wurly shampoo to create bouncy, soft & shiny curls, using coconut oil, eggs and avocado. Maybe on a night when I feel like waking up with more curls, I'll give this one a go. 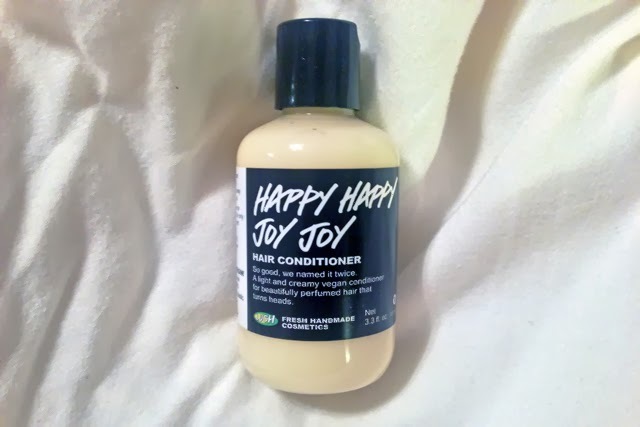 The moment I smelled this conditioner, I was sold. Speaking of summertime, this concoction smells like honeysuckle and heaven, and I wish I could wear it as a perfume. Formulated with rose water, orange blossom water and almond milk base, this conditioner is supposed to soften, beautify and condition every hair type without weighing hair down. Last night I combined Cynthia Sylvia Stout and Happy Happy Joy Joy as a fabulous-smelling hair treatment. I have to tell you that I had no interest in ever getting out of the shower - I felt like I was in a garden! At this point, I didn't care if this conditioner worked or not, because I was hooked on the scent. Before going to bed, I put on the standard Living Proof products - Prime and Frizz, and then tried a Pinterest trick I'd only read about - I slept with a beanie on. I'm sure my husband thought I was crazy, but this kooky technique actually works. Waves at the ends, controlled body at the top, and no frizz. I don't notice an insane amount of shine or hydration, but I'm willing to use these up these samples and conditioner happily to see if the results improve over time. That, and I can't stop smelling my hair. 24 is back. This is not a drill. After high school, I pretty much wrote off American Eagle Outfitters as a teenage brand with nothing to offer. I'm sure I'm not the only one, who, after the days of brand-splaying in raised, cursive felt, ditched all Hollister, Abercrombie and American Eagle-brand items the moment after graduation. But lately something has happened to American Eagle. Every once in a while, I find unbelievably wearable pieces at super-cheap prices. I went into a store this past summer, looking for the perfect pair of skinny, ripped jeans, and came out with a pair of high-rises that garner compliments hand over fist, from the employees at J.Crew, Madewell and Free People to random people on the street. 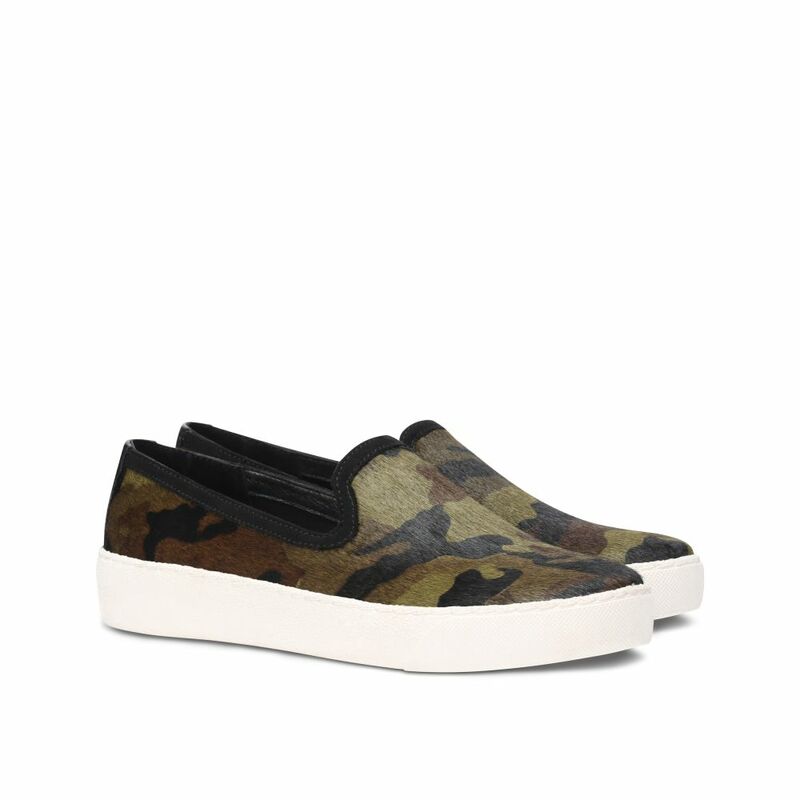 The other day, I went online and ordered these dark, forest-green-almost-black moto jeans, and these sneaker/ankle boot shoes that look like slip on sneakers for cold weather. They may be completely impractical, but I'm going to wear them with leather and layers, channeling Isabel Marant. The best part? Jeans and shoes, under $30. And free shipping. Sneakers are in, and I can't even look at my heels right now without thinking that they're just taking up sneaker space (blasphemy, I know!). Sneaker Budget > Food Budget. Will forsake Starbucks for sneakers. I've noticed that lately, I enjoy books more when I skip the inside cover or reading the back-of-the-book summary. When I go in with zero expectations, I can take each page of the story as it comes, and decide whether or not I like the book as I read it, not beforehand based on assumptions. My to-read list is miles long (and I just discovered an archived note in some stray journal with 20 more titles to read), but when I can sit down and settle into reading with Miss Murphy on my lap, the hours fly by and it's as though nothing else exists. I'm not big on the whole, "My new year's resolution is to jog every day and never eat carbohydrates!" thing, because I hate running and love carbs, but I have a coworker who decided to make a 2014 resolution to read as many books as possible, and is already on book #3 this year. Now that's a resolution I can get behind! 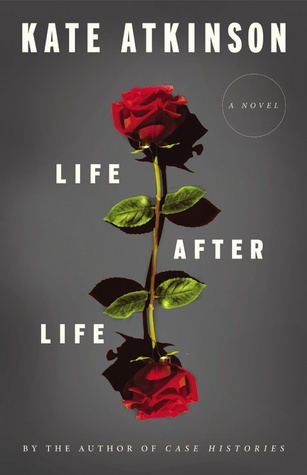 Had I sat and pored over every review, I may have never picked up this novel by Kate Atkinson, but Life After Life is now one of my newer recommendations to friends looking for something different to read. Opening with a quote by Nietzsche, Life After Life asks the question we've all pondered at one point in time, "If you could do it all over again, would you do it differently?" 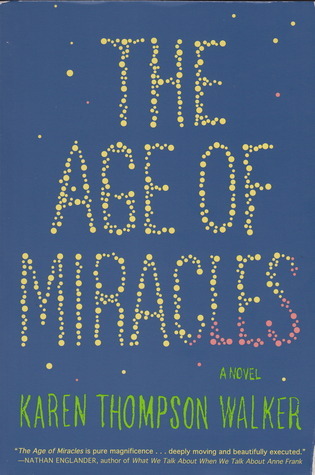 Found as a recommendation on Goodreads, I don't know that I would have picked this book up instantly either, but I'm currently inhaling The Age of Miracles by Karen Thompson Walker. I won't spoil the premise for you - just pick it up and see what you think, but don't tell me the ending. 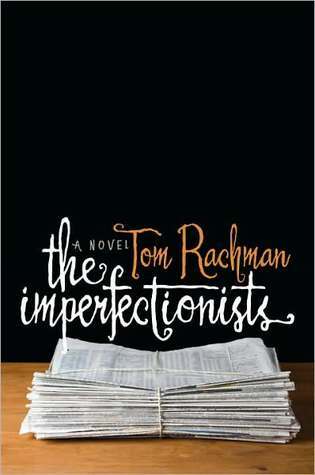 Sitting on my shelf for literally weeks now is Tom Rachman's novel, The Imperfectionists. From Goodreads: Set against the gorgeous backdrop of Rome, Tom Rachman’s wry, vibrant debut follows the topsy-turvy private lives of the reporters, editors, and executives of an international English language newspaper as they struggle to keep it—and themselves—afloat. According to my sister, who knows good books, this is one I'll enjoy. What have you read lately? What are you reading? I made music for your ears. Take a listen! Hey There, Friday: Mix Tape No. 7 from JLRey on 8tracks Radio. When I did the Great Closet Clean-Out of 2013 and wrote down my resolutions for 2014, I vowed to stop saving things. I have heels in my closet, barely worn, pants that I deemed "too fancy" for daytime outings, jackets "too nice," shirts "too delicate" for everyday wear. But my purchases were justified - these things are for special occasions! By shelving my precious items for special occasions, I was really giving myself an out for avoiding fashion risks and channeling the same boring, go-to t-shirt/sweater/jeans combination for my day-to-day. In 2014, that just doesn't cut it. Then I read Refinery 29's 10 Commandments of Style, and found yet another voice championing me to re-wear the fancy pieces for not-so-fancy moments. That, and I just really wanted to wear a fur jacket today, even with my Nike hoodie. What do you have in your closet that you can re-purpose? I never really thought I'd end up being a "dog person," but Miss Murphy has me wrapped around her little paw. One of my dear friends knew in advance that I would melt into a puddle with our little puppy, and gifted me a French bulldog sweater for Christmas with the spitting image of the Murphster (@murphrus), pink bow and all. It hasn't really gotten above freezing here yet, but doesn't this cute little love just warm your heart? When I woke up this morning, I figured the universe was playing some kind of cruel joke. I don't live in Maine, Vermont or New Hampshire. I don't live in New York. This is Texas, baby, and we don't even keep gloves in our jacket pockets. This cold stuff is a joke. Looking out the window, it's a beautiful day, but stepping outside means a wind chill in the single digits, so I l-l-layered up. I'm trying to figure out a way to wear this Free People sweatshirt every single day for the rest of my life, basically. On top of the Free People sweatshirt is a reliable, wonderfully warm French Connection tribal-print cardigan, which even zips up like a jacket, and on top of that is an equally loved BCBG wool trench coat, paired with velvet-feel navy twill pants and a pair of maroon wedge sneakers. This, plus some red lips, and it doesn't matter how cold it is outside - I'm a walking bundle of awesome. Even if I can't really put my arms down. Depending on your outlook, my 2014 is either off to a great or not-so-great start, but regardless of your perspective, it is definitively predictable. I'm having a hard time being motivated to do anything today (including that stuff they pay me for), partly because because when your new canine companion whines while your perma-roommate has a 2 a.m., lights-on, loud-conversation, sleep-talking dream and then tells you that the new puppy is whining because she doesn't like her kennel, not because she has to pee and then dealing with the consequences of an oh, she really did have to pee moment, all the life you have left saps out of you before 8 a.m. I've also managed to not plan for any kind of breakfast at all these past two days, and instead have spent the second day in a row chowing down on my mom's leftover Christmas cookies and Dove promises. I was dragging myself through my inbox this morning when I realized that, ohmygosh, there's coffee here, and better yet, it's Friday! I'm so glad I cleaned out my closet before Christmas, because the new additions are definitely worth the extra space I created! From left to right, top to bottom: A colorblock Madewell cableknit sweater (now 40% off! ), Free People's cozy cocoon sweatshirt, J.Crew's gingham popover (40% off final sale items! ), J.Crew Factory gem bracelet (black version still available at 40% off final sale! ), Crystal Twist Ring from Wanderlust + Co. (just $25! ), the Kensington Satchel from Madewell and the NARS Guy Bourdin lip pencil collection. I'm not necessarily sad to see 2013 go, but I believe in welcoming new things with open arms. 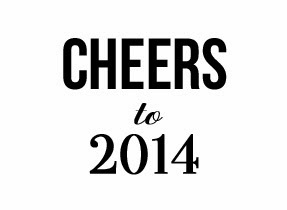 A brand-new 2014 is here, and it's hard to not get in on the blank-slate spirit that's going around. Even though I may have eaten a snack-sized bag of Miss Vickie's jalapeno chips for lunch. C'est la vie. I've had my share of New Year's resolution lists. I've had my share of commitments that have failed and fallen flat. But this year, I'm moving in with a different attitude. 2013 was a year of obsessions. Split-second fascinations that took over every outlet, only to burn out like firework shards into the abyss. In 2014, my resolution is to not become obsessed. To not buy into the idea that one thing has to be everything. To open my heart to every beautiful facet of my life and enjoy each magnificent second - that is what I resolve to do. take time to sit and READ: I want to take time to sit down and read, really read the books I've been checking out from the library lately. I want to read quality stories that enrich my heart and mind, and I want to know that I'm not gleaning every bit of my worldly knowledge from the Internet. MAXIMIZE my hours: Those days where I don't feel like I have enough hours in the day? I want them to go away. I have enough time; I have all the time in the world. What I lack is efficiency. take beauty RISKS: There are lipsticks begging to be worn, outfits waiting to be tried, different hairstyles that have yet to be tested. I want to be unafraid of what people will think, and just do it. bake my own BREAD: I've always wanted a crispy, soft loaf of bread to come from my homemade oven, and this is the year to try it. make time for healthy meals at HOME: Ah, to sit and eat at an actual table with my husband... now that would be better than another Chipotle drive-through. take it out on the EQUIPMENT: There are a lot of stressful things on the horizon in 2014, starting in just a few weeks, and I resolve to not wallow in my own misery. I resolve to take my stress to the street, to the gym, to the equipment, and work it out instead of bingeing on West Wing reruns. Happy 2014. Let's make it wonderful. 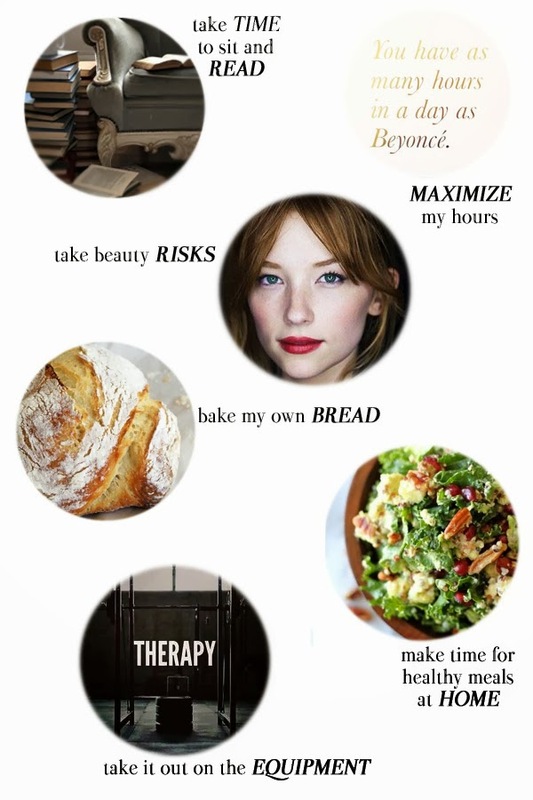 What are your 2014 resolutions?